Treat yourself to a night out tomorrow and help a good cause during Dine for America in which participating restaurants such as Compadres, shown, will contribute a portion of sales to the Red Cross. To be included in this list, e-mail features@starbulletin.com, fax 529-4750 or write Honolulu Star-Bulletin Features section, 7 Waterfront Plaza, Suite 210, Honolulu 96813. 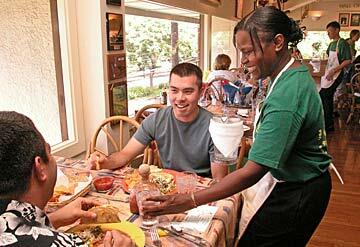 Dine for America: Restaurants nationwide will contribute a portion of sales to the Red Cross. Participating locally are Alan Wong's, Auntie Pasto's, Big City Diner, Buca di Beppo, Cafe Laufer, Compadres, Dixie Grill, Eggs 'N Things, Grand Cafe & Bakery, Gyotaku, Hong Kong Harborview, Hot Dog on a Stick in Hilo and Kaneohe, Hula Grill in Waikiki and Lahaina, Kincaid's, L'Uraku, Ocean Club, Old Spaghetti Factory, Palomino, Pineapple Room, Red Lobster, Roy's five island locations, Ryan's, Sizzler, Shanghai Bistro, Tiki's, Tony Roma's and Yummy Yummy. On Kauai, Keoki's Paradise; on Maui, Kimo's and Leilani's on the Beach; on the Big Island, Korner Pocket; on Lanai, Henry Clay's and Hotel Lanai. Chi: $5 from every ticket sold to "CHI -- a New Era in Circus," 8 p.m. at Blaisdell Concert Hall, will go to the Salvation Army. Tickets are $18 to $38. Call 877-750-4400 or visit ticketmaster.com. Wave Waikiki: 21-and-over party, 9 p.m. to 4 p.m. Call 941-0424. Aloha Quilts: Hawaii Quilt Guild is collecting quilts in baby, crib, lap and twin sizes to be sent to Houston for hurricane victims. Drop off quilts at the Richards Street YWCA, 1040 Richards St., through Oct. 12. Call 595-6434.